Surgery has been performed on a shark at a Dorset sealife centre - in what is thought to be the first such procedure out of water. 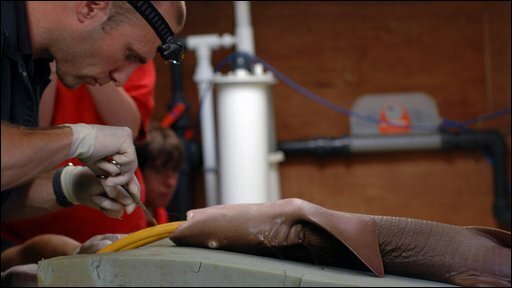 Florence, a 6ft (1.8m) nurse shark, was taken ill at Weymouth Sea Life Park. 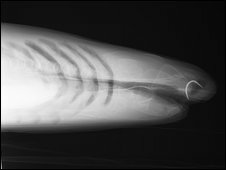 She was anaesthetised while still in her tank, then lifted on to an operating table. Sea water was pumped across her gills to keep her breathing. A rusty fishing hook that had become lodged in her upper jaw before her arrival at the centre was cut out. The operation is also believed to be only the second time a surgical procedure has been carried out on a shark. Florence is now recovering at her new home at the National Sea Life Centre in Birmingham, where she went on show on Wednesday. She was one of four tropical nurse sharks which arrived at Weymouth Sea Life Park a few months ago from Florida. She stopped feeding after a few weeks, so her keepers gave her steroid injections to try to restart her appetite. But she grew "pale and listless", prompting her to be given an ultrasound scan in a mobile unit outside the centre, which revealed the hook. "Seeing what she'd been living with we were amazed that she had survived," said sea life marine expert Dennis Chamberlain. Vet Nick Masters, of the International Zoo Veterinary Group in Bristol, performed the operation. "The hook was very badly rusted and that immediately explained why she had been so ill," Mr Masters said. Florence was tube-fed back in her tank for 10 days while receiving antibiotics. "We began to see a difference in her after about three days," Mr Chamberlain said. "After 10 days she took her first meal unaided and now, just a couple of weeks later, she's as good as new." What is thought to be the world's first shark operation was carried out by a French vet last October at the Nausicca Aquarium in Boulogne. During that operation, the vet wore a wetsuit to stand waist deep in a tank while he worked.